It’s a cordless Dyson. It charges at a wall outlet so you don’t have to worry about dragging a cord around. It’s lightweight and it says it works on all surfaces. 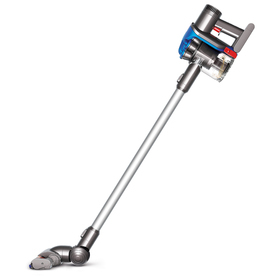 The long pole thing comes off so you can use it as a handheld, or you can use it as a traditional upright vacuum. The Agent’s thinking was that it’s so lightweight that I could use it on the stairs, as well as use it as the upstairs carpet vacuum. I know it sounds ungrateful, but this is not what I wanted. It’s a light weight vac, so it doesn’t have the power to pick up all the stuff on the carpets. I’m not the best housekeeper, sometimes I only vacuum every other week, I need a strong vacuum. It is exactly the type of thing I wanted for the stairs, but I just wanted a cheap little handheld vacuum, I didn’t need a $300 Dyson just for the stairs. I told The Agent that I was thinking of returning it and I know he was disappointed, so I took it out of the box and put it together. I tried it on the carpet, and very little got picked up. It says it works on all floor types, but it really doesn’t have the strength to get two weeks of hair and stuff out of deep shag carpet. But The Agent told me to keep it. His argument was that I had just vacuumed the day before, so there wasn’t anything to pick up. We’re not going to wear shoes upstairs in the new house or allow food, so maybe it won’t be so bad. The roller bar is about half the size of the vacuum we currently have, so I think it will take a lot longer to vacuum with this new one, but I agreed to keep it once The Agent said that I could get the Dyson I wanted once we moved if this one didn’t work out. The good news is, this light weight thing is awesome on the tile floors. And I love that I don’t have to worry about a cord. So I think I’m going to keep it downstairs and use it on the wood floors instead of a broom. I used it on my kitchen and it took me two minutes, when normally it takes me at least 10 with a broom, and I always find stuff I miss afterwards. But even this presents a problem. My girlfriend recently got a Roomba from a flea market for a great price. She said it works great, and I asked her to find me one for my birthday. I would much rather have a little round robot cleaning my wood floors while I’m at work than me having to do them when I get home. I will see her next week… if she gets me a Roomba-- that I asked her to get from a flea market-- I will not be able to return it. Sigh. I feel bad. I should return the Dyson. I feel like The Agent wasted $300. But The Agent told me to keep it…. What should I do? Aw, that's a tough situation. It sounds like it means a lot to the Agent for you to keep the gift. In which case, it's probably a good idea to do that. I know it's $300 that could be used for other things, but sometimes it's more important to let someone else know we value them. I've been wanting one of those! But I already have the awesome yellow Dyson. I would highly recommend it. Better yet, get both! Thank you for your lovely comment! Make sure you link back to either your email or your blog so I can reply! Someone once told me that if I didn't have anything nice to say, I shouldn't say anything at all. So I started a blog instead. I am a writer. I Entertain. Nothing I write on here should be considered truth. If you read something on here that sounds like something that's going on in your life, it's purely by coincidence. Remember, nothing on a blog is true unless you admit that it's true. Live. Laugh. Pull your hair out. You decide: Hopeless or Full of Hope?